Head and neck cancer includes any cancer arising in the nasal cavity, sinuses, lips, mouth, throat, salivary glands or thyroid gland. Tobacco and alcohol use are the leading cause of mouth and throat cancer. However, there has been a recent rise in the incidence of oropharyngeal (base of tongue and tonsil) carcinoma in younger adults related to human papillomavirus, which is a highly prevalent sexually transmitted viral infection. Over 10,000 oral head and neck cancers per year can be attributed to HPV. Human papillomavirus is a known risk factor in developing head and neck cancer, specifically oropharyngeal cancers. There are over 100 types of HPV, but HPV types 16 and 18 are most often associated with oropharyngeal cancers. The HPV vaccine, Gardasil, may help reduce the risk of head and neck cancer in the future. Signs and symptoms of head and neck cancers often vary from person to person, and can be present in the nasal cavity, lips, mouth or throat. If you have noticed a sore or lump that does not heal, schedule an appointment with your doctor for an evaluation. If you are experiencing symptoms of head and neck cancer, it’s important to consult with a medical professional. Your doctor will review your medical history, conduct a physical exam and perform tests to determine if you have head and neck cancer. The tests conducted often depend on symptoms present, and allow doctors to examine a sample of tissue to determine if cancer is present. If it is confirmed that a person has head and neck cancer, the next step is understanding the stage. X-rays and additional testing can help a doctor determine if the cancer has spread, and come up with the best treatment plan for you. The best treatment for patients with head and neck cancer depends on many factors including the type, size, location and stage of the cancer as well as the patient’s overall health including their respiratory status, current swallowing or voice function, cardiac and renal status. Treatment options for head and neck cancer patients may include surgery, radiation, chemotherapy or targeted therapy or any combination of the above. The majority of patients present with locally advanced disease. 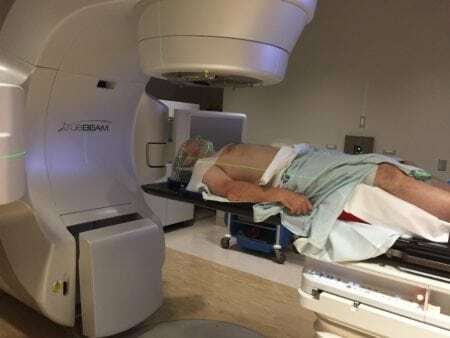 While extensive surgery may play a role in select patients, many patients with locally advanced disease are treated with radiation with or without systemic therapy. Our team of 30+ board-certified physicians are proud to serve patients from across the Southeast U.S. To learn more about your head and neck cancer treatment options, give us a call or schedule an appointment to visit one of our cancer treatment centers in Charlotte, NC and surrounding locations. Surgery is an important component of therapy for appropriately selected patients. Surgery may include just a biopsy for diagnosis or may be an extensive surgical procedure with the intent of surgical cure. The extent of surgery varies based on the diagnosis and stage of the cancer. The surgeon may remove just the tumor or may also remove lymph nodes in either one side or both sides of the neck Some surgeons are now performing transoral robotic surgery (TORS) which may improve the surgeon’s ability to resect certain types of tumors. Systemic therapy can include either chemotherapy or biologic/targeted therapy. A medical oncologist will help determine which therapy is best suited for you. It may be given in advance of radiation (neoadjuvant chemotherapy), at the same time as radiation or rarely by itself. Radiation in the head and neck region is often delivered using intensity modulated radiation therapy (IMRT). This advanced radiation treatment technique allows your radiation team to develop a plan that shapes the radiation so that it goes to the areas of concern while avoiding nearby structures that do not require radiation. Use of IMRT often in conjunction with image guidance allows your team to confidently target the areas of concern with a high degree of precision and accuracy. There are many different ways to deliver IMRT including forward and inverse planned techniques, modulated arcs, and tomotherapy. All of these techniques allow for the safe delivery of radiation to the target volumes while minimizing the exposure of nearby healthy tissues to high doses of radiation. Despite these advanced techniques, radiation to the head and neck region is often a difficult treatment. Symptoms are often exacerbated with the addition of chemotherapy. Many patients receiving chemotherapy and radiation to the head and neck region may require an evaluation for swallowing dysfunction. Often times patients may require placement of a temporary feeding tube to ensure adequate nutritional and hydration support through the course of treatment and during the immediate post-treatment recovery period (the first few weeks to months after radiation is completed). Your physician may recommend that you be evaluated by a speech and swallowing therapist to assess your ability to swallow, and your potential need for a feeding tube. Patients undergoing radiation therapy usually need a dental evaluation before proceeding with treatment as radiation may cause patients to have a dry mouth, and this can increase the risk of cavities. Additionally, if the jaw bone receives high doses of radiation it can increase the risk of subsequent dental surgeries. Thus, if there are teeth that need dental attention it is ideal to have these issues addressed before starting radiation when possible. Physical therapists may play an important role in the management of patients with head and neck cancer. Side effects of therapy that therapists might assist with include: lymphedema or swelling of the neck, trismus (difficulty opening your mouth widely), or problems with the neck and shoulders particularly in the post-operative setting. Nutritionists are also important members of the treatment team and can provide value guidance on dietary recommendations as well as nutritional assessments before during and after your treatment course. Patients going through treatment for head and neck cancer need significant support physically, emotionally and financially. A cancer navigator (a nurse, social worker or other knowledgeable individual), may be an excellent resource for assisting patients in meeting these needs.